Can you Guess The Picture ? 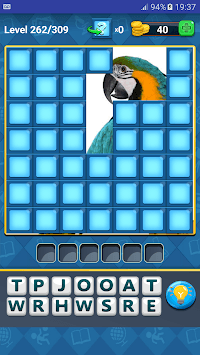 Tap the tiles to reveal hidden squares from the picture. As soon as you think you know what it is, take a guess! The less tiles you open - the more coins you get! You can play Guess The Picture in 7 different languages, just select the one you prefer! And since you’ll probably get stuck a time or two and unable to guess the pic, make sure to use some of the hints to help you along the way. *Get reveal - gives you one more reveal. *First letter - opens the first letter of the word. *Remove letters - removes most of unused letters. *Ask friends - this free hint allows you to share the pic via Facebook and ask your friends to help you to guess the picture. *Skip level - skips the puzzle. You can use it if no other hint helps you and you can't guess the pic. Even earn free coins by watching cool videos. There are also thematic level packages for you and your kids, so each one can find his favorite package. 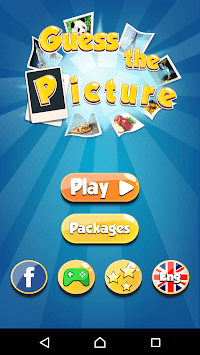 Enjoy 1000+ interesting levels of Guess The Picture puzzle game. So what are you waiting for? Just Guess The Picture! 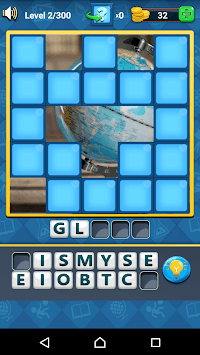 Download now and enjoy 1000+ levels of Guess The Picture puzzle game.